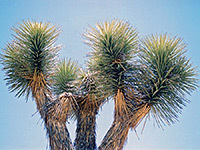 There is no shortage of mountains in Joshua Tree National Park though not many are easily reached. The best place for a wide ranging, high elevation vista is Keys View, reached by a paved road, then next easiest are the two peaks that have a maintained trail to the summit - Lost Horse Mountain and Ryan Mountain. Of the many unmaintained routes, one of the shortest is the hike to the top of Queen Mountain, at 5,677 feet almost the highest point in the park. 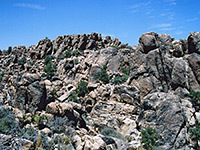 The path is 2 miles long and gains 1,100 feet in elevation, as it climbs steeply up the southern face of the mountain. The starting point for the Queen Mountain hike is reached by driving 1.9 miles along a narrow, sandy, smooth track across Queen Valley, branching off Park Boulevard 2.3 miles west of Jumbo Rocks Campground. 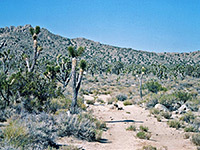 The road passes through a nice forest of Joshua trees and ends at a small parking area near several concrete structures from an old mine. The trail has no noticeboard or register but is easy to follow at first, starting as a wide path (formerly a vehicle track) up between two low hills and across a flat area towards the base of the mountain. The land hereabouts bears plenty of cacti including cholla, densely covered in spines that are nearly pure white in color rather then the usual yellow. The old track stops at the edge of the foothills though a much fainter path continues eastwards for half a mile then turns north and climbs steeply to the summit along a shallow ravine, up slopes that become increasingly rugged, dotted with bushes, yucca and many other cacti though no Joshua trees. The route is intermittently marked by cairns but once heading uphill the exact path isn't so important; there are various different ways to reach the top. Views from the summit encompass Queen Valley, Ryan Mountain, Wonderland of Rocks, Pinto Mountains, and much distant, desert land to the south. The path has plenty of footprints at the lower end but it seems not so many people continue to the summit, owing to the difficult route-finding required.